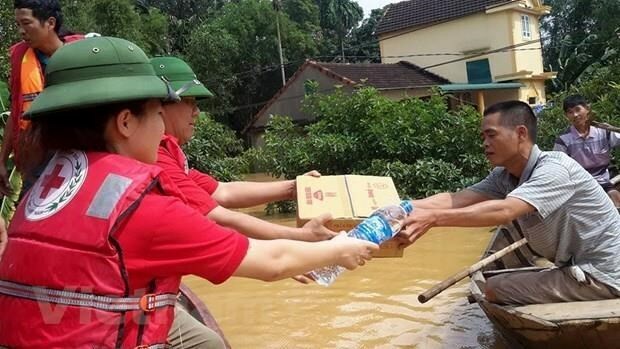 Hanoi (VNA) – The Vietnam Red Cross Society (VRC) and the Red Cross Society of China (ECSC) have signed an agreement on a cooperation project worth 1.5 million CNY (223,400 USD) in support for activities to build safe communities in Vietnam. The agreement was inked during talks between VRC President Nguyen Thi Xuan Thu and visiting ECSC Vice President Wang Haijing in Hanoi on March 26. At the talks, Thu spoke highly of the Chinese organisation’s coordination with and support for the Vietnamese side’s activities. She expressed her hope that both sides will maintain discussion to boost coordination in red cross work and humanitarian activities. Wang Haijing suggested the two societies continue collaborating in delivering emergency relief, increasing income of people in underprivileged areas, and supporting children with disabilities. The host shared that Vietnam is striving to build 10 safe communities in areas vulnerable to natural disasters. Therefore, the country wants to learn from China’s experience in building safe communities to minimise risks caused by disasters and in managing emergency relief item warehouses, she added.